Now that summer is about over, people from all around the world are ramping up their fall and winter travel plans. The culture of Central America is a key reason many travelers love to visit. Central America is an incredible part of the world to travel around. The region is part of the North America continent and runs between Mexico and south to South America. If you are looking for an exotic travel destination, consider a trip to Central America. The region is comprised of seven total countries. They are Belize, Guatemala, Honduras, El Salvador, Nicaragua, Panama and Costa Rica. As travel costs continue to be relatively inexpensive, there are some amazing travel deals available to Central America. Are you looking for a romantic getaway? How about a memorable family vacation? We wanted to share some special couple and family package ideas to explore Central America in VIP style. Panama is a beautiful destination. 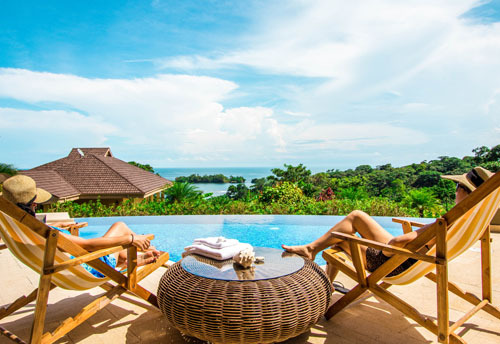 Stay at the luxury Red Frog Beach resort (photo above) in Bocas del Toro. For a romantic getaway with the love of your life, enjoy the best Panama has to offer. Walk hand in hand along stunning beaches. Ride horseback through the Panama jungle and visit an indigenous Indian Village. Enjoy numerous outdoor water activities. This secluded, luxury resort is highly regarded. Forbes even named Red Frog Beach as one of the hottest beaches anywhere in Central America. So many things to do and it’s also a perfect destination for families. Surrounded by a national park and the Caribbean Sea, Indura Beach & Golf Resort is a fantastic place to enjoy a luxury vacation. Located on Tela Bay in Honduras, Indura Beach & Golf Resort is recognized as the area’s top hotel by TripAdvisor. The resort is new and has received numerous accolades for its high level of service and luxury amenities. For golf lovers, play on the resort’s 18-hole Gary Player golf course. There are so many activities to participate in. Enjoy snorkeling, swimming and even tai chi and yoga on the beach. Try deep sea fish, whitewater rafting or zip lining. Families will love getting out and enjoying nature. View monkeys, exotic birds and gaze up at towering mangrove trees. This luxury resort lies on a gorgeous 26 mile stretch of beach offering amazing ocean views. Take the family and explore the beautiful coral reefs. There is so much to see and do. Get immersed in the true culture of Central America. Magical Belize is a paradise that needs to be discovered. Take your entire family and spend time together in this beautiful country. Book the Family Soft Adventure package stay in Placencia on the Southern coast of Belize. Robert’s Grove is a terrific property with three pools to splash around in. The property also offers kid friendly dining. Enjoy the warm waters and try snorkeling with nurse sharks. What a cool experience! The luxury resort sits upon 22 acres of lush tropical land. Walk around the art-filled gardens or stroll along the expansive beach. Be sure to explore the largest Barrier Reef in the Western Hemisphere! It’s a dream come true vacation. It’s vacation time! Contact our travel concierge specialists for help planning and booking your dream vacation. There is so much to enjoy. Take in the culture of Central America with a truly VIP experience. Come back soon and follow our popular luxury blog. Read about the latest luxury hotel news.